Red stretches out and breathes in the fresh air as he arrives at the seaport city of Vermillion. The boy looks towards the harbour from the green meadows he's standing on and spots a luxurious liner with the name S.S. Anne printed on the side of the hull. He decides to check it out and dashes towards the seaside as Pika, Poli and Saur trot along happily. A few moments later, Red arrives at the harbour and is amazed by the size of S.S.Anne. A sailor walks by with a big box over his right shoulder and the boy decides to sneak into the ship by creeping alongside the big man under his right side. The man is preoccupied by his heavy-load lifting and never takes his eyes off his way, and this gives Red the chance to board the liner without anyone's notice. Once on board, the boy ventures along the corridors and finds stashes of boxes all over the place. Red thinks he saw some movement in the boxes for a moment but then decides he's just imagining it. He continues to walk down the corridor as something catches his eye in one of the rooms. He peeks into the oval window of the door but sees nothing in the dark room. Suddenly, the shadow of a mass creature looms into view and it roars at the face of the boy. Red falls back immediately and the noise causes sailors to flood in. They yell that the liner is currently restricted to non-crew passengers and kick the boy off the deck. Sitting on the ground holding his painful bottom, Red hisses at the hostility of the sailors and wonders what pokemon it was that lurked inside the dark room. Suddenly, an odd-looking man in suit and hat with big sunglasses and a stick walks up to the boy from behind and asks him if he possesses any pokemons. Red says he does and the bearded little man fervently urges the boy to show him. Confused and annoyed, Red releases Pika, Poli and Saur as the little man's face lits up with stars. The man introduces himself as the president of the Pokemon Fan Club and immediately admits Red as his premium member. 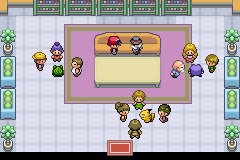 Later, at the clubhouse of the Pokemon Fan Club, Red enters with the president to find a room full of pokefans. The boy watches the people exchange news of their own pokemons as the president stuffs the newest issue of their club magazine in his hands. The funny little man introduces Red as the newest premium member of the club to everyone in the room and in a matter of seconds, people's hands are all over Pika, Poli and Saur. A young woman asks Red how long has he owned Poli and the boy explains that he grew up with it when it was still a Poliwag and that it has helped him a lot throughout the years after its evolution, especially in battles recently. This remark gets the whole room silent. The president slowly walks up to Red and ask him if he really uses pokemons in battle and the boy nods. The man explains that the members of the club never engages their pokemons in battles, then embarrassingly says that as a result their pokemons are always weak. The door suddenly slams open as a man rushes in and exclaims that his Exeggcutor has gone missing. Everyone in the room put on a serious look as the president sadly turns away to look at a photo on his desk. The people explains to Red that the president's Abra has been stolen a month ago and since then, more and more pokemons have vanished into thin air. The president breaks into tears and Red decides to help find the missing pokemons. The people says that the mass pokemon disappearances occur once every month and the boy wonders what means would the culprits use to house and transport away such a large amount of pokemons. He looks out of the window to see S.S. Anne and asks about the liner. One man explains that the ship belongs to the gymleader Lt. Surge and that he ships goods to Cinnabar Island once every month. Red remembers the strange creature he encountered on board and decides the liner must have something to do with the pokemon disappearances. He is about to leave and investigate when the president stops him and says he has one final request. Red listens intently to the man, only to hear that he simply wants to hold and play with Pika when the boy goes off to the ship.